Rooftop Reviews: Movie Review- Charlie Bartlett with Robert Downey, Jr.
Movie Review- Charlie Bartlett with Robert Downey, Jr. This film is a unique look at today's high schools and the choices/pressures faced by todays students.. Think of it as today's "Rock and Roll High School" but on designer drugs. The big difference is that this movie has a message and draws a conclusion. 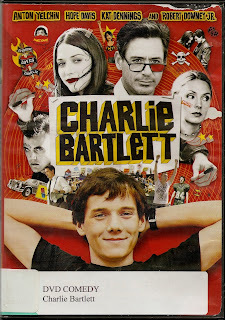 As seen thru the eyes of a former prep school boy suddenly thrust into a Public High School, Charlie Bartlett comes to understand power and the great responsibility that goes with it. At the same time he and the Principal, played by Downey, both come to understand that we are all equally screwed up. And that can be a strength, rather than a weakness, when we let it serve to unite us. With crisp and clear performances by all this is a very unusual film and worth the time.